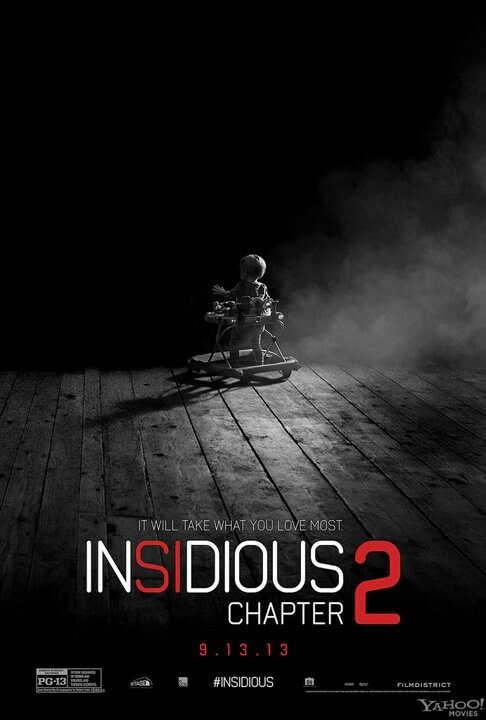 My Quick Review: I have to admit that after watching the first Insidious, Chapter 2 was a bit of a letdown. It was to be expected since I knew that we would be spending more time into the Further than we did in the first movie. And this was definitively not my favorite part of Insidious. Chapter 2 starts with a young Josh being haunted by the ghost who appeared at the end of Insidious. There we met a young Elise who successfully help Josh get rid of it as well as his memories and abilities in astral projection. Back to the present, Josh is possessed and his family starts to feel something is off. The haunting of their new home will push Renai to seek some paranormal help again. The main problem with Insidious Chapter 2 is the lack of genuine scares. I believe I only had one jolt whereas I had more than a few in the first Insidious (even during a second viewing). The main ghost here is not creepy enough and his backstory is somewhat lacking as well. I did appreciate the way some events tie in directly into the first movie (similar to how some Saw sequels explained some events of past movies) and, technically, the film is superb. James Wan has truly become a Master Of Horror and he will be missed by horror fans as he apparently decided to quit doing scary movies for a while. 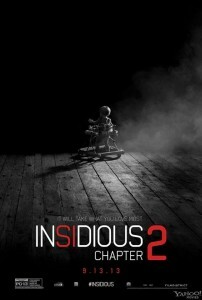 If you enjoyed the second half of Insidious you will love the way Chapter 2 expands on the Further. For people looking for more scares, they might be a bit disappointed and should maybe stick with The Conjuring, the scarier of James Wan 2013 movies. Hi, I’m a student and I’m actually studying a module of Web. I’m writing a blog on horror movies but it’s not completed yet. I need to have more ideas and I was hoping to get help from you if you don’t mind. I must say that your blog is super cool. I like the way you write and give a foretaste of the movies without ruining it by a summary of the whole story. It is better that trailer as the latter show only the good sides of films. As your explanation is clear and direct it is obvious that it could be understood by anybody. I won’t not lie, I’m quite disappointed about Insidious 2 after having read your post. I appreciate your honesty toward the subject and to be frank I was not expecting that much from a chapter 2 but still I was hoping to be scared many times. Anyway I’m still going to watch it when I will be able to get the movie. I was hoping to put videos of trailer and pictures of movies on my blog like you did but unfortunately as it is a university project, too bad, I’m not allowed to do so because of copyright laws. Thanks for the nice comments. Glad to hear you wanna start writing your own reviews. If I have one advice, it is to write from the heart. Just say what you feel about a movie and don’t overthink it too much. I’m not a writer or a journalist and have no pretention to be, I’m just a horror movies fan myself. As for Insidious Chapter 2, yeah I was disappointed but I’d still recommend to watch it. Great work here Eric. I’m been reading a lot of your reviews and I’m a fan of what you’re doing. I also did a review of this movie on my blog a while ago. It’d be great if you could read it over and see what you think of it! Thanks for the kinds words Joe. Checked your blog and while it’s just the beginning it looks promising. Just keep at it and write with your heart!